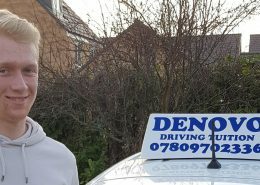 Denovo is one of the leading driving schools for manual lessons* in Peterborough, with exceptional first time pass rates and great reviews from our pupils both on our website and on Google, where we are proud to have an exceptional level of authentic** five star reviews for an independent driving school in Peterborough. We offer a great introductory promotion, subject to availability, for new learners that saves you £90.00 on normal lesson fees. If you would like to know more please call Denovo on 01733 590019. *We do not offer automatic driving lessons. ** Please see our informative blog post about Fake Reviews. I went through several previous instructors before I found Denovo driving school. I travelled from an hour to receive tuition due to the lack of professionals closer to my hometown and wouldn’t have wanted to start my driving journey with any other driving school. My driving instructor was not only accommodating to my specific needs, but very understanding to tailor my lesson plans to exactly what skills I needed to learn to help me progress. Couldn’t recommend the company anymore to anyone looking for a comfortable and safe environment to start their own personal driving experience. I passed my driving test at the first attempt and it was all thanks to the patience and professionalism of my instructor. He made learning to drive a really enjoyable and fun experience. He makes you feel comfortable when driving and allows you to learn at your own pace. Furthermore, he was very thorough with every detail of your driving so that you don’t just learn the skills to pass a test, but you learn the necessary skills to drive safely and competently for the rest of your life. 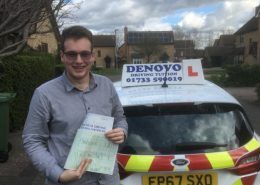 All of this combined with his dedication to his students and enthusiasm for driving means that I would recommend Denovo Driving Tuition to anyone in Peterborough or the surrounding areas. At first I was nervous with my driving lessons, but my instructor, was excellent at teaching me all the basics, and making me feel much more confident behind the wheel. After my first lesson I couldn’t wait to get in the car again, as I found all the lessons very fun. 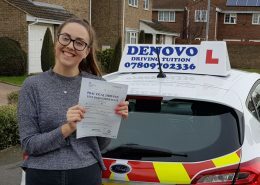 The quality from Denovo has been nothing but exceptional, the whole time I was with them, and I wouldn’t hesitate to recommend them to anyone who is new to driving. With the great teaching from my instructor, I was able to pass my test first time, and I couldn’t be more pleased with the service! I started lessons when I was 17 and failed four tests over a 2 year period. I lost my confidence so therefore gave up driving. I moved cities and started driving lessons with Denovo. My instructor was brilliant at re-educating me and restoring my confidence in driving. My instructor was an excellent instructor and very thorough with explanations. I have really enjoyed my experience and I passed first time with Denovo. My instructor always put 100% effort into helping me to improve my driving at all times. Not only did he prepare me for my test, but driving for the rest of my life. Great service and would recommend to everyone! I have just passed my driving test first time, which I am over the moon about. This is all down to having a great driving instructor. My instructor was a very positive guy, who makes you feel relaxed and always encourages you to ask questions and makes you feel comfortable. He was also a very professional instructor, who always puts you first. He was very clear to understand and makes you feel confident. He always encourages you to take your driving to the next level through steady progression. I can’t rate Denovo any higher if I tried. 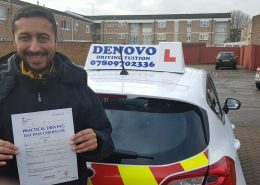 If you want to learn to drive with a smile on your face, Denovo Driving Tuition is the company for you! Thank you very much.! I had been looking forward to being able to drive for ages and taking a driving test but I had no idea where to start. 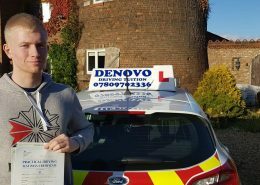 There were plenty of schools about but I settled on Denovo and I definitely could not have done it without there guidance, patience, and my instructor had a good sense of humour! I could not believe it could be such an enjoyable experience and I felt the lessons were tailored perfect for me. He kept encouraging me to ask anything about anything to do with tests in the car or by phone and he was always there with a reply straight away. Glad he did because I passed first time. Cannot recommend Denovo driving tuition enough, top marks from me!! Cheers man.